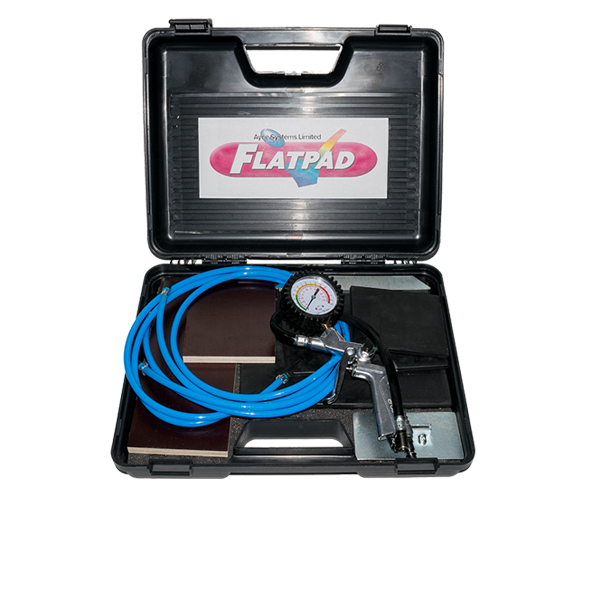 The Flatpad Dent Repair Kit is a newly developed panel repair system. The system works on air pressure with specially produced pillows. The pillows are made out of special vulcanised rubber which is oil resistant, reinforced with kevlar fibres. Damage in tailgates, doors or quarter panels can be removed by placing the pillows behind the damage and inflating with the special air gun. Each bag inflates to a different depth, the most appropriate one is selected for the job. This then enables the technician to quickly and easily 'pop out' sizeable dents before final dressing. Each Flatpad kit includes 3 pillows (small, medium & large), an airgun with deflating valve and a 6 bar security valve, and a steel plate to push swage lines and edges. For more information about our Flatpad Repair Kit click the button below to download the print friendly PDF brochure, or if you would like to receive a quote for this kit, please click the request a quote button.